We had about 2 months in Greece, and we really enjoyed it. We arrived in early November from Albania and took a ferry to Italy a few days into the new year. We visited 2 islands: Corfu by ferry and Santorini by flight (leaving Blac for a few days). On the mainland we visited Meteora, Thesssloniki, Halkidiki, Delphi, Athens, Corinth many things along the way as well as a fairly thorough coverage of the Peloponnesus. In this post I want to give some information relevant to other Overlanders coming to Greece, especially in winter. In winter most of the campsites are closed, so it's best if you are able to survive without a campsite and the amenities they provide (electricity hookup, wifi, bathrooms, chemical waste dumps, and fellow travellers for companionship). We free camped in most of Greece, but we did use a few campsites too. Winter campsites all had discounted pricing for the low season, and most had reduced facilities and maintenance too. Frequently other motorhome travellers would tell us that grocery shopping in Greece was more expensive than they had anticipated. But there's a common mistake they were all making. I won't mention any names but there's a European supermarket chain known for cheap prices. This chain has stores in Greece, but unfortunately their prices in Greece are much the same as their prices in Belgium, which isn't inline with the Greek economy. I found that if we grocery shopped in local supermarkets, fresh food markets, and even mini markets the prices were cheaper, and the produce local and fresh. We visited two islands: Corfu and Santorini. Corfu we visited with Blac. Luckily we took the ferry service that goes to the South of the island. It's less expensive, and by taking it you don't arrive into the populated area. Corfu is a good size for driving and we spent 4 nights there. Santorini we visited by flying in. Originally we had thought we'd travel with Blac to Crete but when we found out we'd be flying to Australia soon we decided we didn't have time to go to Crete. Leaving Blac with Skypark near Athens airport and flying to Santorini was a much cheaper option, and was a wonderful break from our usual way of life. Greek drivers seem to have little respect for road rules. Commonly, they overtake on double lines with no visibly. They double (and sometimes triple) park all the time. But most disturbing is that they seem totally confused about roundabouts. Commonly, in Greece, people on the roundabout will give way to the vehicles entering the roundabout. It obviously creates problems. Occasionally it was signed that a particular roundabout should be deal with that way, but even when there were stop or giveway signs entering the roundabout drivers on the roundabout would stop and try to waive us on. Of course, in many countries biggest vehicles get right-of-way regardless of official rules, and we're rather big. We loved our time in Greece. The winter weather was really good. A couple of cold days but mostly we had glorious sunshine. Greeks are friendly and dining out the food was always good and inexpensive. Also, for travelling Greece has lots to offer: fantastic coastlines and beaches, ancient ruins and fantastic museums, quaint villages and vibrant cities, castles, monasteries, canyons, marvels of engineering, the islands (of course), and even skiing. 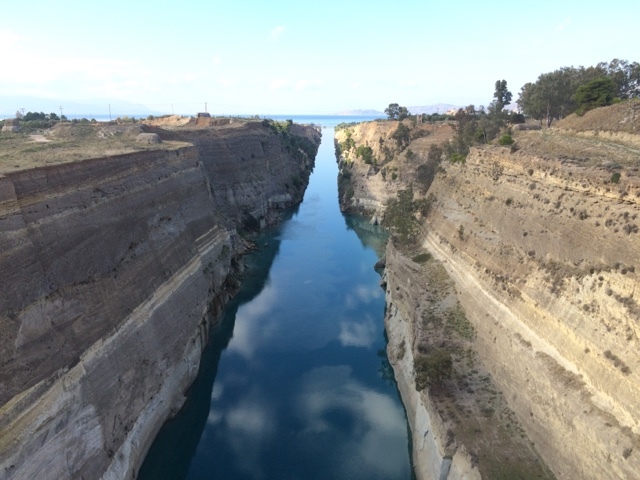 Corinth Canal, a canal with a great history. 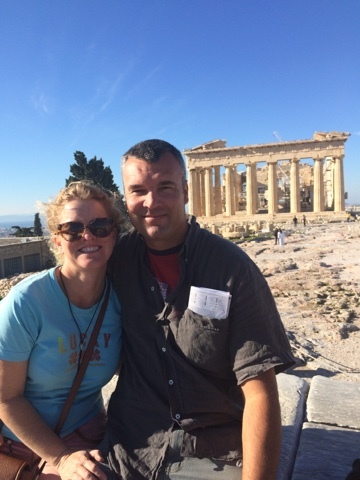 H and I before at the Acropolis in Athens.